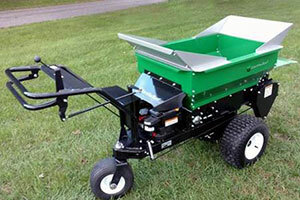 Earth & Turf Products, a compact topdresser company, unveiled its Model 60SP, a maneuverable, self-propelled topdresser. Ideal for spreading dry or wet compost, sand and a variety of other materials, it features a 6.7-cubic-foot hopper for easy loading. The machine’s maximum load weight is 650 pounds. Optional loading chutes help increase capacity for lighter materials such as compost, and a wide-spread beater produces an even spread pattern up to 42 inches wide, according to the company. The 60SP is powered by a 190cc Briggs & Stratton, 875 series, 6.5-hp engine. The drive is by CV belt, forward and reverse, said the company.